The photograph above was my introduction to Pentti Sammallahti. I was altogether charmed by it. In some ways, it’s not at all representative of Sammallahti’s work; it’s clearly manipulated in post processing and it features an amphibian. In other ways, however, it’s a classic example of his photography. It shows the stark landscape of Northern Europe, it utilizes a very clearly defined horizon line, the subject is an animal, and it displays a certain puckish sensibility. 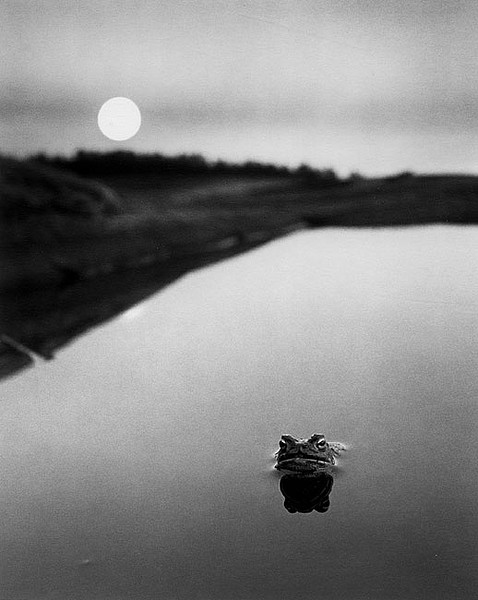 Pentti Sammallahti was born in Helsinki in 1950 and has become one of Finland’s pre-eminent photographers. His work tends to explore the relationship between humans, animals and nature. He manages to somehow combine a rather formal Finnish aesthetic with a wry Scandinavian sense of humor. The animals in his photographs aren’t simple generic beasts; they generally either exhibit a very distinct personality or they’re depicted in some sort of relationship with a human. Because of the landscapes he features in his work…the flat, sparsely populated regions of Lapland, with their marshes and unending lines of pine forests…Sammallahti often uses a panoramic camera. This perspective highlights the feelings of isolation and space, which often has the effect of creating the impression of hardy independence in both his human and animal subjects. By working almost exclusively in black and white, the ‘chilliness’ of the landscape is enhanced. Sammallahti is also one of those photographers who are engaged in the entire photographic process. Not just the taking of the photograph, but the developing and printing as well. With his art books, which are necessarily printed in small number limited editions, Sammallahti takes the photographs, makes the prints, designs the layout, and selects the typography. He’s even been known to operate the rotogravure printing presses. That sort of attention to detail and quality pays off. As a result, Sammallahti (who had been teaching at Finnish universities for 17 years) was awarded an unprecedented 15 year arts grant from the government of Finland. Since leaving the university Sammallahti has traveled more widely, taking photographs in the Welsh countryside, in Nepal, in Japan, in Turkey. Despite the radical differences in the environment in which he takes his photographs, his work retains the same simple aesthetic, not to mention the same formality, the same charm, and the same wit. For me, the real magic of the work comes from the fact that the animals in his photographs always seem to be going about their business in a matter-of-fact but still delightful way. One senses they move through the frame…that they’re just passing by and in the next instant, they’ll be gone. And yet the landscape will remain, unchanging and unaffected and constant. 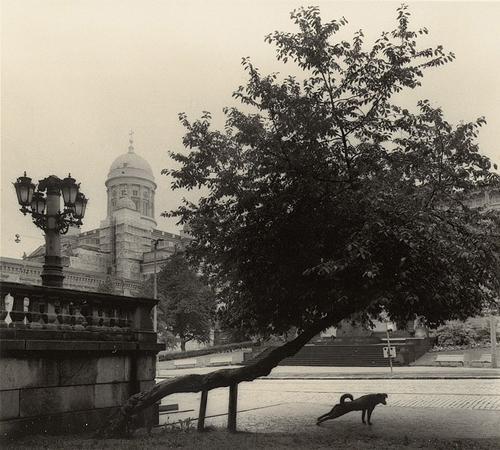 That balance between the ephemeral and the etermal is, I think, the true theme of Pentti Sammallahti’s work.